Thank you for your interest in Hands-On Minds-On Technologies (HMTech). Unfortunately, sessions for the 2018 program are full. If you would like to be added to the mailing list for next year’s program, and to receive any other information about programs throughout the year, please send an email with your name and email address to blc-hmtech@sandia.gov with the Subject header HMTech Contact List. 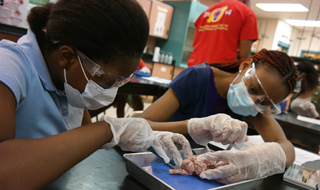 HMTech is a summer STEM program provided by the Black Leadership Committee for middle and high school students. 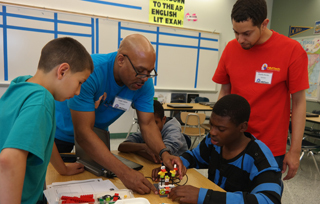 The program gets students involved in fun, hands-on, science and engineering activities and provides an opportunity to explore a variety of STEM careers. HMTech is based on volunteers giving their time to make the program a success. We are in need of teaching assistants, program volunteers, and photographers. No special skills required, just a desire to help with the program. If you are interested in volunteering complete the volunteering form. Thank you in advance for your interest! Note: Volunteers may be requested to pass a background check.